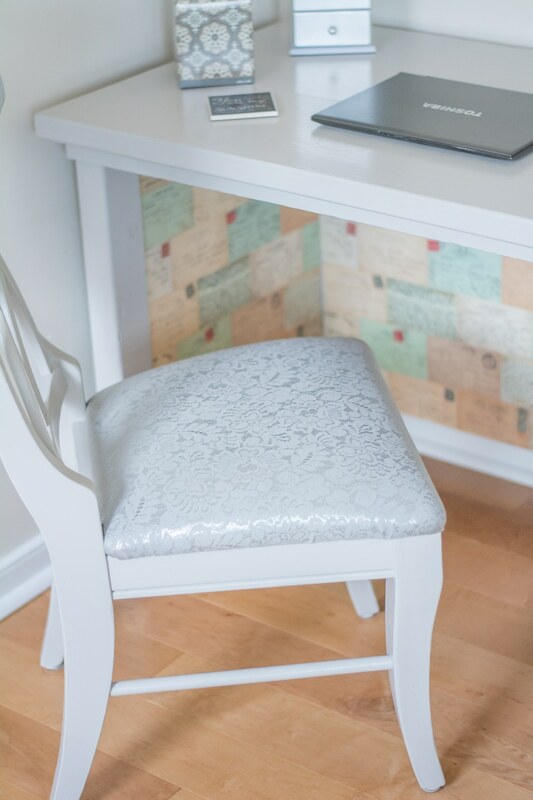 Earlier today, as I was working on reupholstering the cushion for my new desk chair, I said to Mike, “If you would have told me one year ago that I’d be reupholstering my own furniture, I’d laugh.” And there I was, stapling fabric onto a Habitat for Humanity ReStore $10 chair. 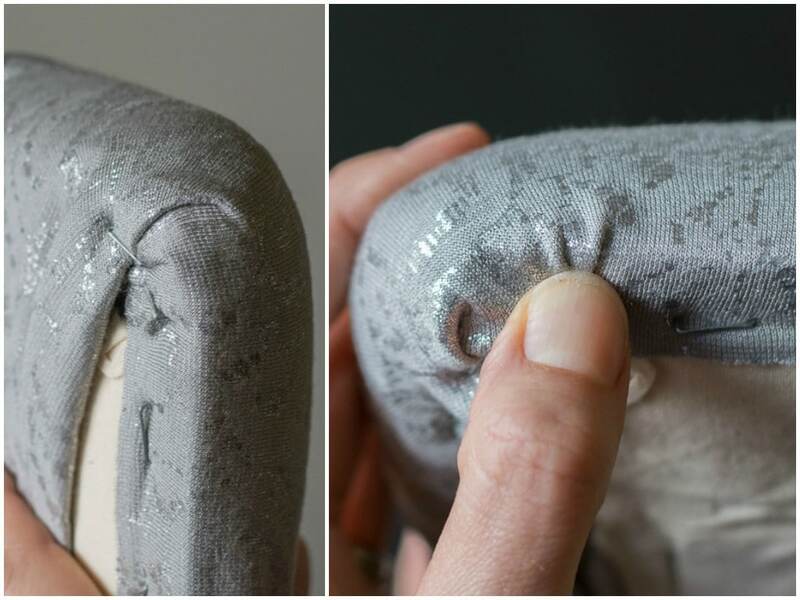 Turns out, the great thing about reupholstering a chair cushion is that it’s reeeeally easy. 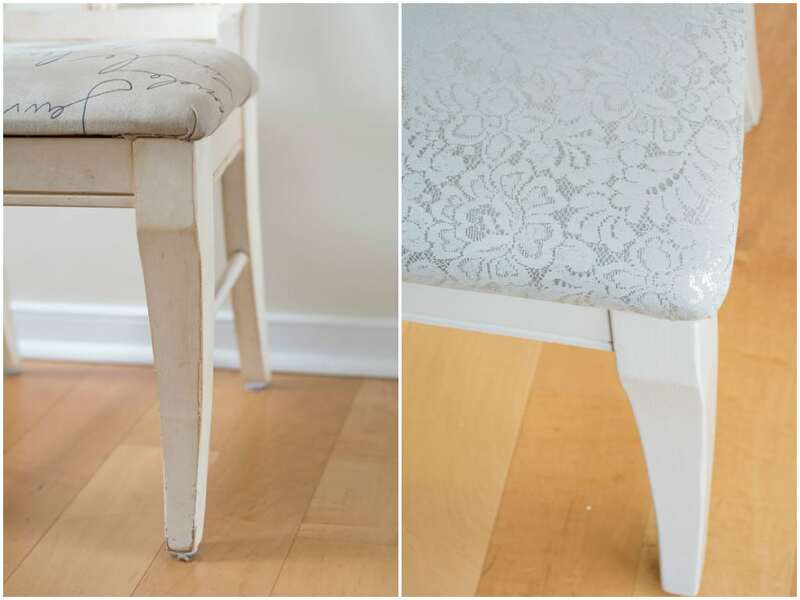 Although it sounds like something you need to be qualified to do, it’s really something that you only need some fabric and a hand-held staple gun to do. And it only takes three steps. 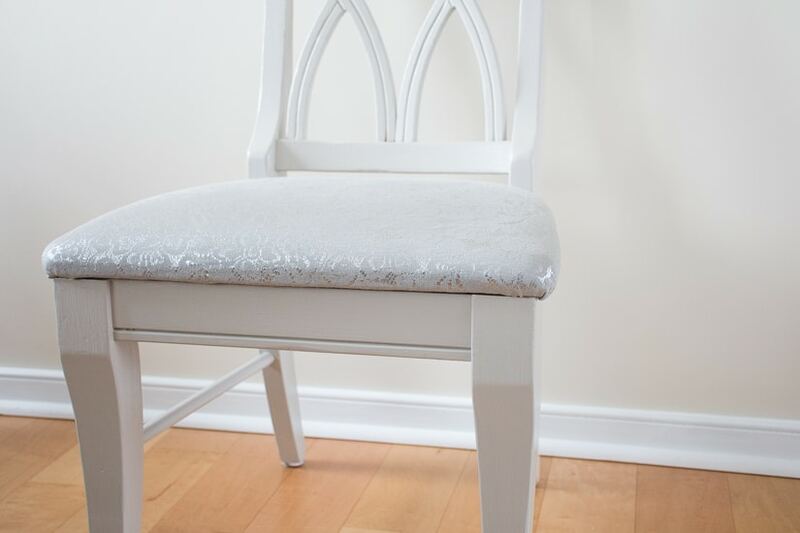 If you’d like to figure out how to reupholster a chair cushion of your own, read on! Measuring tape (I didn’t measure my fabric; instead, I eye-balled it and cut the excess fabric off after stapling). Before I got started, I had to rip the old fabric off. 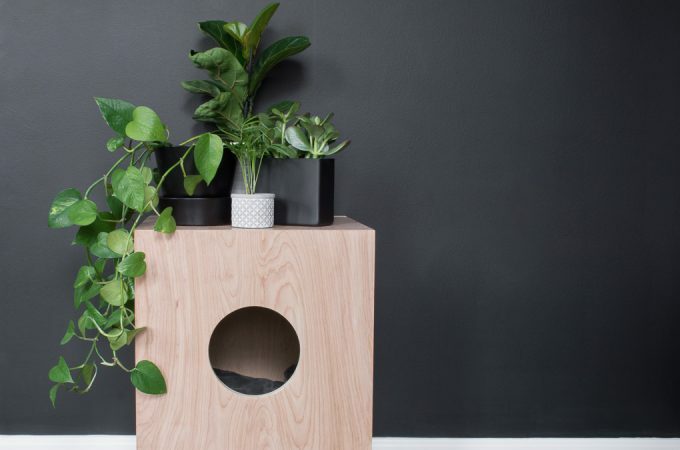 You’ll probably be able to do it with just your hands, but you may need the help of a flat-head screw driver to pry up some of the staples. With the old fabric off, I was ready to go. Step #1: Choose a fabric, measure it, and cut it. 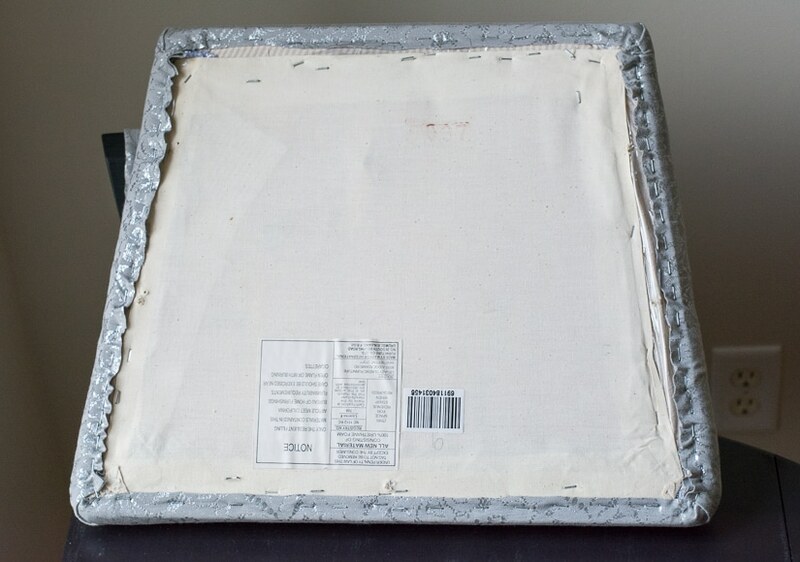 Make sure you leave enough to wrap around each of the four cushion edges. 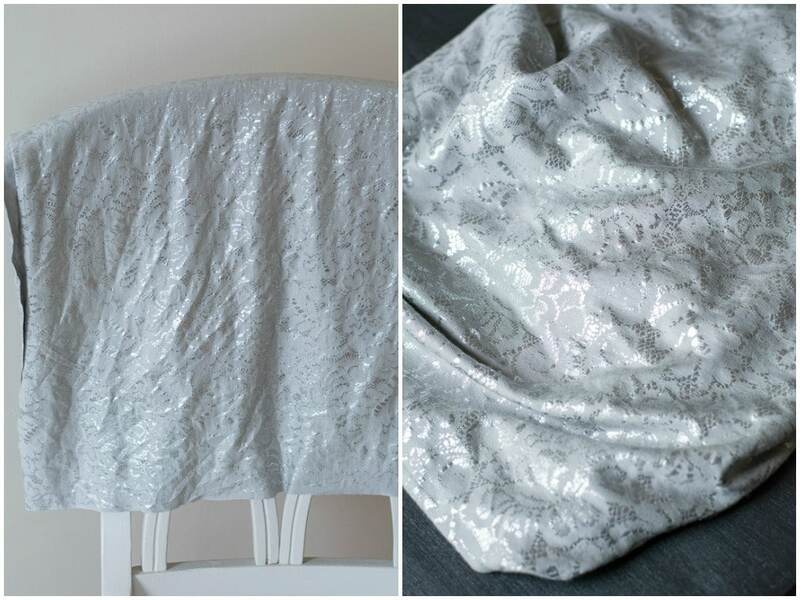 I chose a stretchy knit fabric to give myself a little wiggle room and to ensure I could fit it snugly around the cushion. Since it was stretchy, I didn’t need to iron it first. 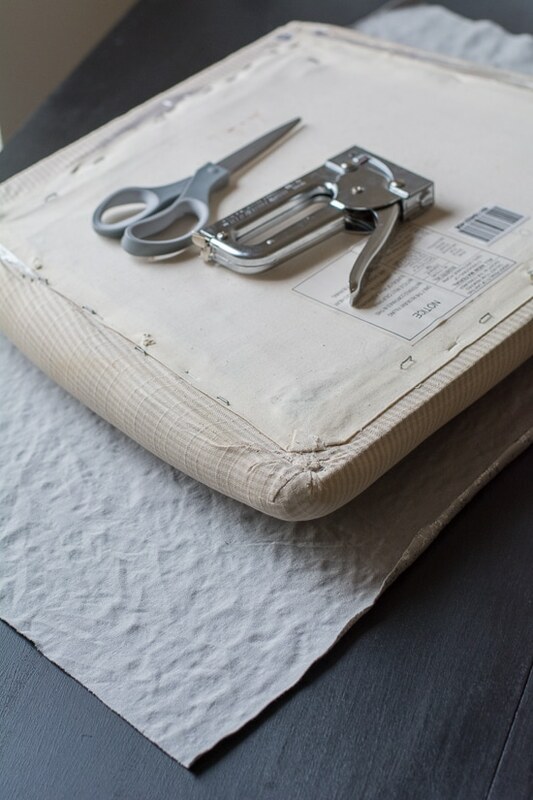 If you want to be lazy and not measure, you can wrap the fabric over your chair cushion to ensure you have a big-enough piece before cutting it. Step #2: Lay the fabric out with the right side facing down. 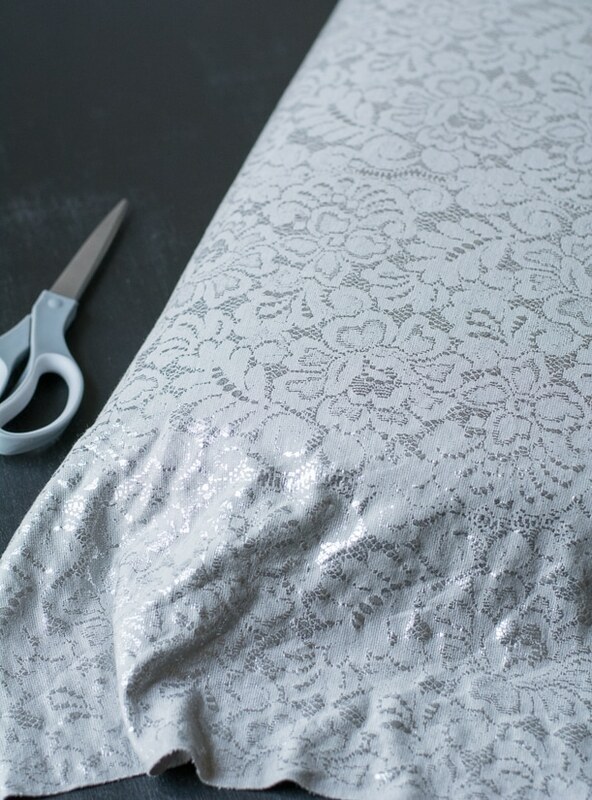 Then, set the cushion upside down on top of the fabric and start stapling the first side of the cushion. 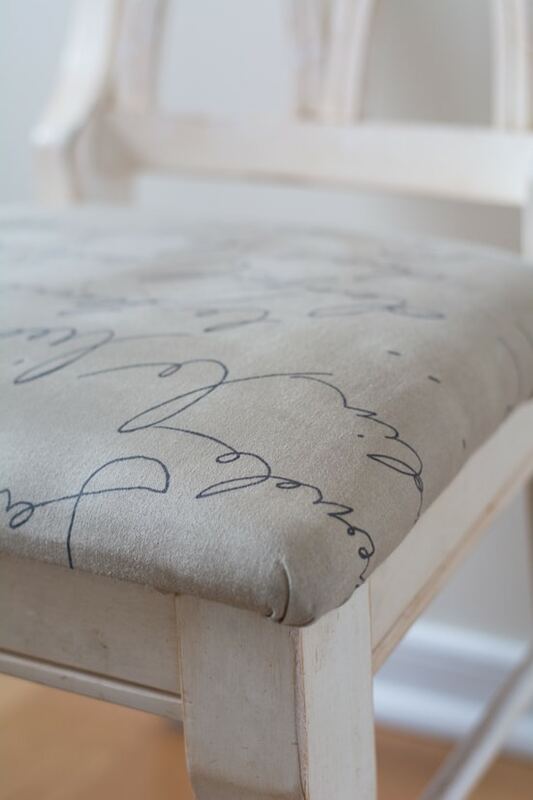 To do so, simply staple a straight line along one side of the cushion (below, left photo). 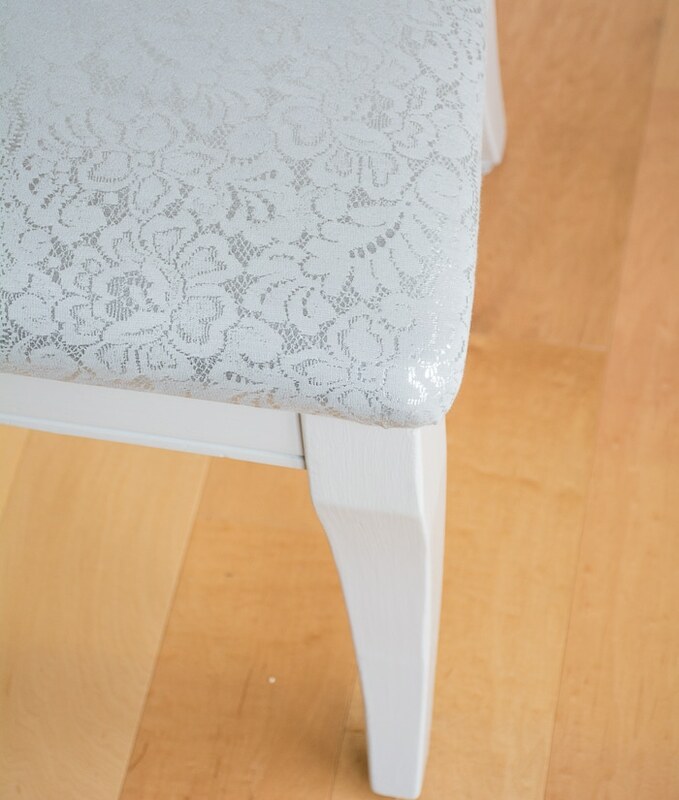 When you’re done, pull the fabric tight to ensure your next line of staples (the opposite side) doesn’t leave any fabric wrinkles. Step #3: Staple the side opposite of the side you just completed; then, staple the two remaining sides. Think of it like wrapping a present. 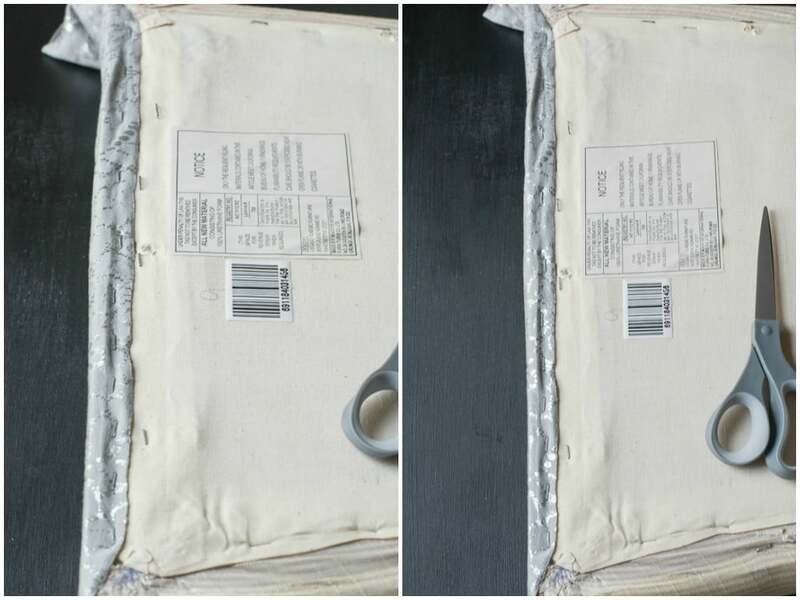 You want to wrap opposite ends first, then the sides. 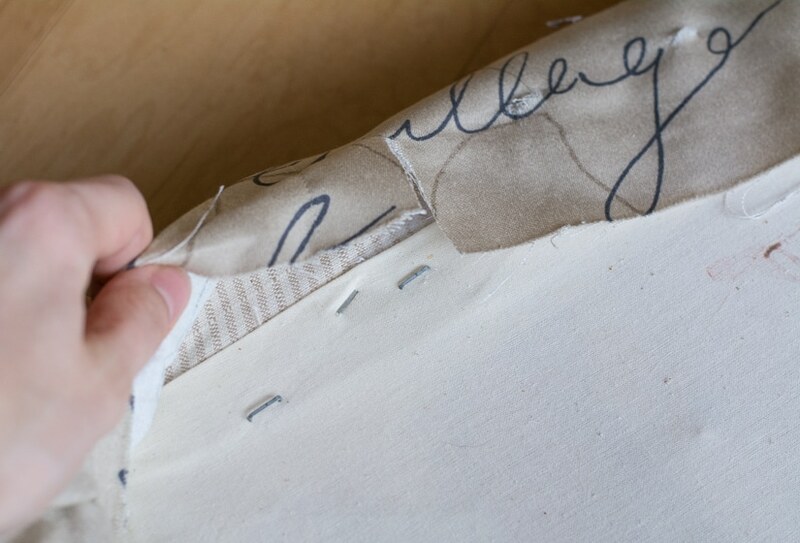 Make sure you’re pulling the fabric tightly around the corners as you staple. See? 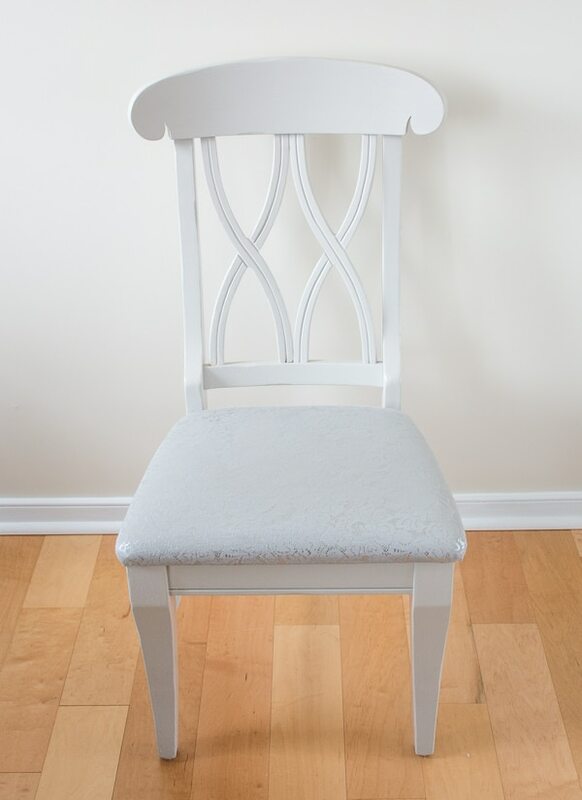 Super easy, and the chair has a much cleaner, brighter look than before. Hi! 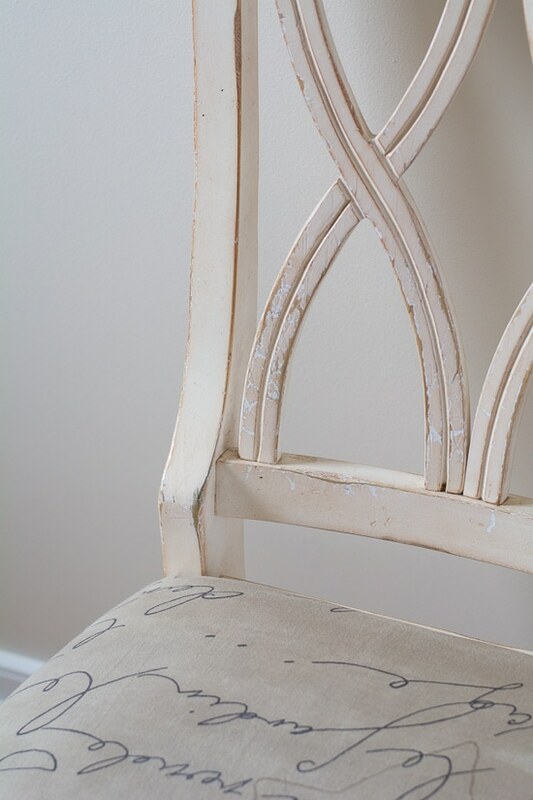 Thanks for all the details about painting on your blog. 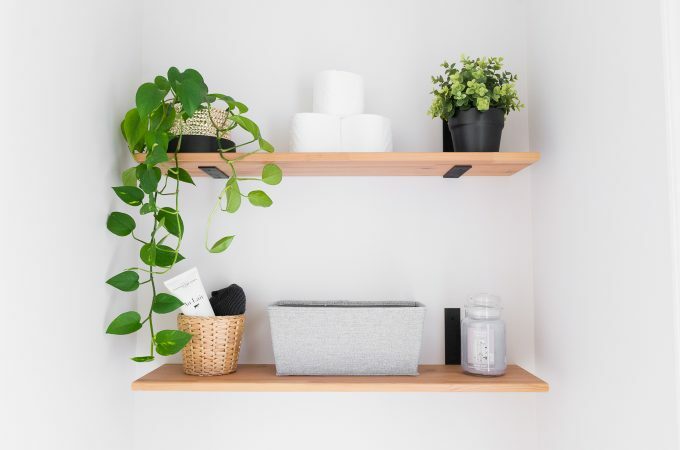 Questions…..is Primitive white? 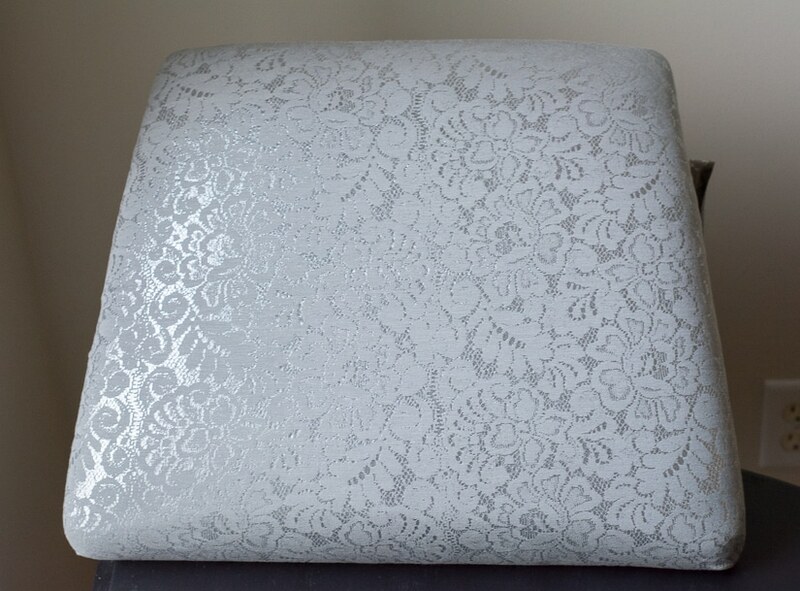 it looks like it should be grey, but your chair and desk look white. Also, how do you decide if you want to finish with a wax, varnish from Americana, or polycrylic ? I am looking to do various pieces in my house, but don’t know what to finish with. Hi Sarah! Primitive is a very light gray. 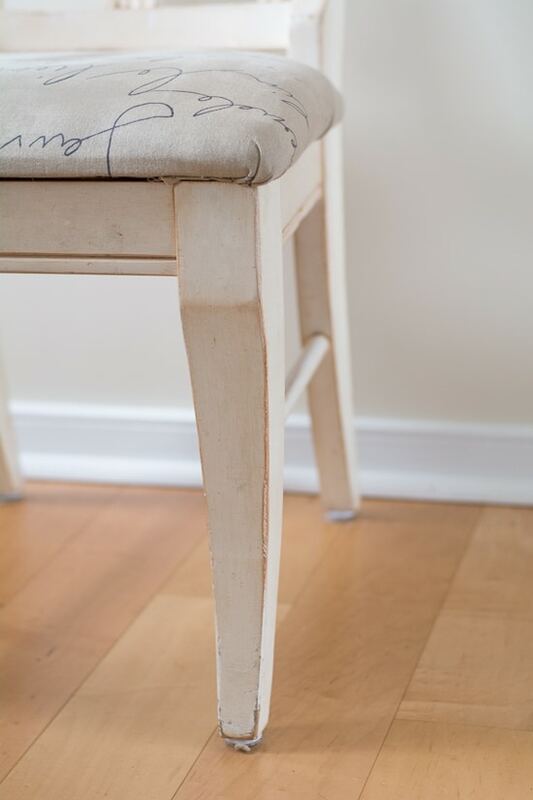 The line’s true white is Everlasting. 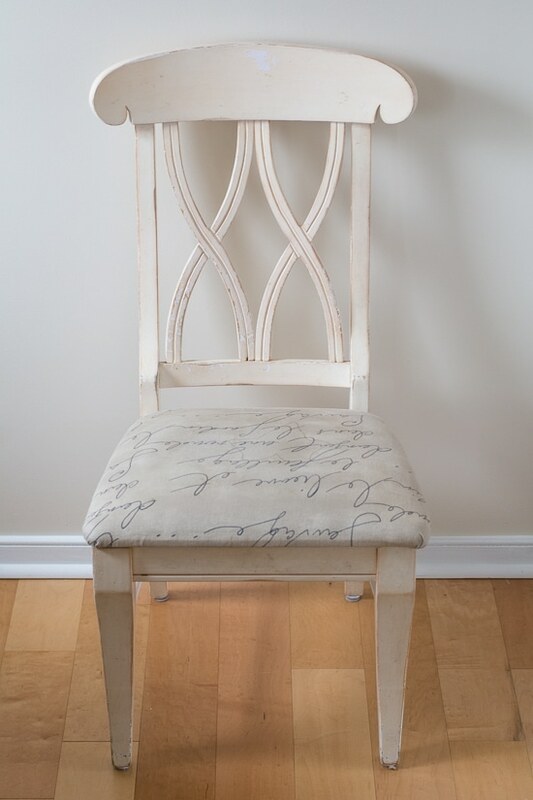 here is another chair done with Primitive, though I’m looking at a Primitive-painted stool in my kitchen right now, and it doesn’t look that dark–but it is close. I decided against using wax because I want something that I could apply with less work, I also wanted something permanent. Wax looks great, but it has a steep learning curve. I love all the Americana varnishes because they only require 1-2 coats, and they give a nice matte sheen. But I’ve also used a polycrylic when I wanted more shine. Good luck! Love this. You make it look so easy too. I am dying to try this but never been brave enough! I may well just go and do this now!! Thanks, Jenne!! Good luck and let me know if you have any questions!